Racist organisations like the KKK, neo-nazis and white supremacists should be banned. Racism or any discrimination, hate speech and violence have no place in any civilised society. No one should have the freedom to incite hatred and promote inequality. It’s not freedom of speech, it’s a crime. No society should tolerate, racism or any kind of hate fueled rhetoric, bigotry and intolerance. 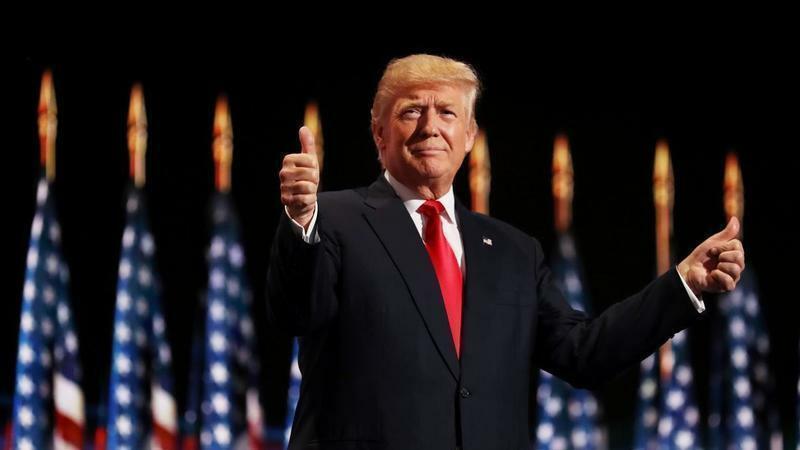 Charlottesville was a shocking display of racism which has no place in the modern world, racists emboldened by the bigoted rhetoric of president Trump, yes we have to occasionally remind ourselves that this man is the president of the US and supposed leader of the free world, though I do not accept him as such. He has fanned the flames of racism and other discrimination, bigotry and intolerance and Charlottesville is the result. Why the hell can’t we all learn to live together regardless of race, creed, gender or any other perceived difference. There is so much misery in the world, I cannot understand why people such as these vile excuse for human beings have to create more. Wouldn’t the world be a better place if equality, tolerance and acceptance of each person was common place. Human beings should have no enemies other than death and disease, certainly not each other. Yet racism and other intolerance thrives and is on the increase along with the insatiable greed of the few at the expense of the many. We should unite for a better world where inequality, intolerance, social injustice, racism and any other prejudices are a thing of the past, a world where we can live out our lives in peace promoting the common good of all, including the other species with whom we share this world, and put all our energies in preserving this planet for all, including future generations. Please check out Care2’s suggestions for how you can help Charlottesville in the aftermath of this terrible incident of open racism, bigotry and hate. “…mobilize your communities to get white supremacists out, because community resistance works. Organizers successfully shut down a rally in Colorado Springs, another at Texas A&M, and one in Richmond to protest the removal of Confederate monuments. The “peaceful” March on Google, organized by white supremacists in nine different cities, following the firing of James Damore has also been canceled! August 26th and 27th and September 9th plus other suggested actions. Read more and take as many of the suggested actions as you can. Label the “KKK” a terrorist organization! Please read more,sign and share this petition. Groups such as the KKK have no place in any modern society. There hate fill rhetoric incitements to violence and the acts of violence perpetrated or encourage by them are crimes and it is time they were recognised as such. Please read the following, which over the weekend was Care2’s Daily Action and features a Human Rights Campaign video, and share widely, the world needs to know these are not “fine people” but racist fascist thugs who must not become an accepted part of American society. “Last weekend the world watched in horror as white supremacists, neo-nazis, and KKK members marched with torches and violently clashed with anti-fascist protestors in Virginia. Instead of condemning hate, President Trump has blamed “both sides” for violence, and criticized the media’s coverage of the violent event, even going as far to say there were “very fine people” at the rally. Video shows that this isn’t the case. White supremacists shouted racial and homophobic chants and insults to protestors, and one woman was killed when a White supremacist purposefully drove his car through a group of peaceful demonstrators. There is only one side spewing hate. Watch the Human Rights Campaign video and share with your networks. Frankly RACISTS DISGUST ME, don’t they think that there is enough hatred, violence and misery in the world without people like them creating more. It is important to note that there are many people who oppose racism. 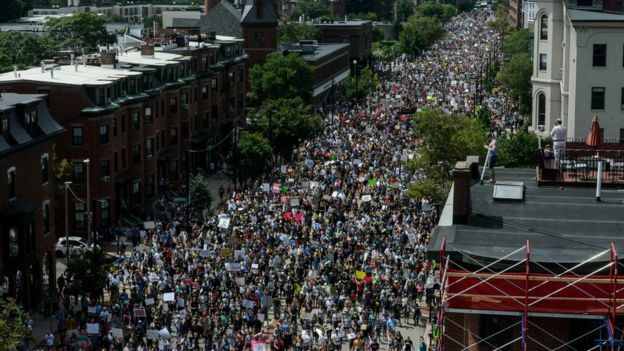 Tens of thousands of anti-racism protesters have opposed the “Free Speech” rally in Boston that featured right-wing speakers. The world is now ever more turbulent and it is increasingly more difficult to know where to begin to protest the onslaught as equality, social justice, decency, compassion fight against a seething mass of bigotry, social injustice, racism, right wing subjugation of the poor, increased abuse of animals, war … well the list is just so long. The headlines, as biased to the right as they are here in the UK, mostly seem more interested in Sport, the new opiate of the people, than much else. Seemingly sport is more important than the misery mostly inflicted by the right wing and those of right wing mentality – the other night a sports segment on the BBC came before any mention of the fiasco in North Korea where two psychopaths who hold so much power rattle their sabres with the resulting possibility of leading us to the brink of nuclear war. Undercover of all this the Tories continue their agenda with increasingly more austerity as if the disaster of Grenville Tower, the result of austerity, greed and neglect had never happened. Right wing political ideology, particularly in its extremes as is the case today, will never bring about social justice, a fair world and a just society, it therefore must be eliminated permanently. The world it seems is becoming more right wing, more fascist, racist and intolerant and the struggle to procure a decent existence for us all more of a challenge. 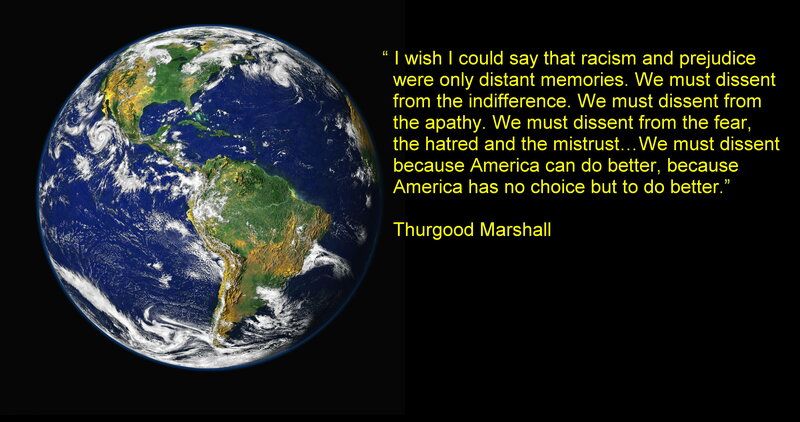 I am shocked by the displays of open racism in the USA, the violence, hate, bigotry and intolerance. What an appalling display of hate in Charlottesville as an ugly crowd of vile racist thugs, emboldened by the bigoted rhetoric of Trump’s extreme right wing agenda, wreaked mayhem. Such has no place in the modern world, it is sickening to every decent person. We need to bring about change in the world urgently including here in the UK. We need to stop the spread of the right wing chaos that is making the lives of millions a living nightmare. We have to keep speaking out against the rise in right wing agendas which are changing our world, taking it back to a time we once thought had passed into history. Here the Tories systematic destruction of our social progress seems to go unnoticed lately. Take Action – Join a protest in Manchester. If you live in or can get to Manchester here is an opportunity to voice your protest. The People’s Assembly will be holding a week of protest, demonstrations, cultural events, rallies, comedy, music and public meetings all across Manchester while the Conservative Party hold their conference there. The election result has left Theresa May and the Conservative Party with a weak, unstable Government and represents a rejection of their vicious policies that only benefit those at the top. The week of action will demonstrate the huge opposition to the politics of austerity, racism and war and demand an alternative that works for everyone. Full timetable avaliable soon – accomodation & transport will be avaliable. This is great opportunity to speak out please consider taking part. Please share information about this event widely. If you need some encouragement here are some reminders of the Tories huge contribution to the misery of life for the majority of us. Austerity which transferred wealth from the majority, including the poorest made increasingly more poor, to the already fabulously wealthy. And an increase in the use of food banks which continue to rise to name just some of the more serious consequences of austerity for the many for the advantage of the few. Cuts to fire and police services Tories have reduced police jobs by 34,000 with the result of an astonishing rise in the crime rate with more cuts on the way. A similar situation exist concerning fire fighters with 10,000 job cuts , again with more cuts planned by 2020. Cuts to education Continued cuts to education are planned. Well the list is long. The above are highlights of the damaging Tory policies which affect the vast majority of us and which are the more familiar. Here is a detailed list of thirty damaging Tory policies which includes some of the above links and from which much of the information above was scoured. We must do all we can short of violence to rid ourselves of this blight to humanity (namely RIGHT WING POLITICS) the other species with whom we share this world and the plant itself if we are to ever have a decent existence which values the right to life, and a good quality of life, for every being that exists. Ousting the Tories and replacing with a real socialist Jeremy Corbyn is a good way to start. When I was twelve, I went hunting with my father and we shot a bird. He was laying there and something struck me. Why do we call this fun to kill this creature [who] was as happy as I was when I woke up this morning. If you don’t have time to read the information below but would like to bring an end to grouse shooting scroll down for action you can take, including two demonstrations on the 12th August. As I have said time and time again I cannot understand the mentality, the cold indifference to taking the life of another sentient creature by hunting or shooting, but to get pleasure from doing so is even more baffling. Moreover few people who participate in blood sports ever question that there is anything wrong with killing animals for fun. In the video below the shooter shoots from the sky a beautiful bird in full fight, ending the life of this defenseless unsuspecting creature simply for pleasure. It turns my stomach, makes me sick inside as it does most people. That is why the majority of people in the UK and worldwide would rather see an end to such wanton killing as a result of so called sport. Grouse Shooting is the sport of kings says the shooter in this video. The sport of kings indeed, is this saying meant to elevate this cruelty? Hunting and shooting is more like the sport of psychopaths! It is sickening that anyone can glorify such a vile act of cruelty against other feeling thinking sentient beings. It shames us as a nation that we allow this barbarity to continue. To be fair there may be a few who simply fail to comprehend what they do and there are those who even give up blood sports however for the majority it is a much anticipated pass time undertaken with disregard to the suffering caused. Wild animals never kill for sport. Man is the only one to whom the torture and death of his fellow-creatures is amusing in itself. While for many people grouse shooting is deemed undesirable because of the harm it does to other creatures – including Hen Harriers and Peregrines as is emphasis of the video below – it has be said that grouse shooting is inhumane simply because it kills 700,000 grouse each year. All animals to my mind are equal and for each individual animal his or her life is important. However if the concern over the killing of endangered species rather than the grouse itself brings about an end to grouse shooting all well and good. The important thing is that no animal is harmed or killed whether it is a grouse, a fox or a hen harrier. A number of animals are killed deliberately because for one reason or another their existence interferes with the number of grouse available for shooters to use as living targets. So you see it is not only the unfortunate tiny grouse who are killed or harmed and left to die a slow painful death but other wild animals and even domestic animals become victims of this outdated cruelty of a bygone age. Look carefully at the photo in the tweet below a vehicle filled with beautiful mountain hares murdered – yes I am going to say murdered what else is it – in order to protect grouse from hare-born disease. Basically killing one animal in order to have plenty of another animal to kill, simply for pleasure. Humans also get maimed or killed participating in blood sports such as hunting and shooting. There are no statistics for the UK . However as far as I can ascertain there have been fatalities here. A woman in Oxford back in March 2016 was left shaken after deer hunting accident when a bullet was shot through her window. Whilst no one was injured things most certainly could have been quite different. There have also been significant and serious incidences of hikers killed during hunting in the USA and Canada, Also in Italy during, a four month period 35 people were killed in hunting accidents. It can only be a matter of time before something like this happens here, in areas such as the Yorkshire and Durham Dales the Yorkshire Moors, anywhere where people have the right of way there is always that risk. Concerning the UK and indeed world wide the licensing of guns to hunters and shooters puts a deadly weapon into the hands of people who have violent tendencies – there is surely no one who can argue that hunting and shooting is not an act of violence. It is bizarre when you think about it but most licenses are issued to people to kill animals, though some licenses of course are issued to people for sports such as clay pigeon shooting. Here in the UK 567,015 people have a shotgun license , any one of them can use their weapon to kill not only helpless animals but people also, as was the case of Derrick Bird in Cumbria who shot twelve people with the gun he used to kill rabbits. Make no mistake these are deadly weapons which maim and kill helpless animals with the potential of killing defenseless humans also. The less weapons in public hands the less the chances of people being killed. The following article includes a short video of the cruel and untimely death of animals killed by a gamekeeper in one of the UK’s National Parks. These animals are deemed to interfere with the numbers of grouse available for the shooters to kill. Warning images which some people may find disturbing. I found the images upsetting, sickening as I find it disturbing that anyone can wantonly shoot helpless animals who have as much right to their lives as the person who shoots them, as do the grouse and every other being that lives. Vast areas of our countryside are managed in this way to prepare for the massacre of these tiny helpless birds for no other reason than some disturbed sense of pleasure and enjoyment. Why should a large percentage of our countryside be used and it’s inhabitants abused simply to satisfy the bloodlust of a very small group of over privileged people to kill helpless wild animals simply for enjoyment for four months of each year. Shooters are wealthy, some extraordinarily so as are the people who profit from organised shoots. A few years ago now while in a pub in the Yorkshire Dales my husband and I got into conversation with a former sheep farmer who was now retired. He told us that he had sold his land for the purpose of shooting as he was approached to do so and made an offer he could not refuse. A considerable amount I assume paid simply to have access to the land for four months of the year just to kill helpless birds, shoot them from the sky after driving them into the line of fire by terrifying them by a method referred to as grouse beating – hunting for grouse by trying to drive them towards the shooter by using flags, sticks, and other devices. As long as men massacre animals, they will kill each other. 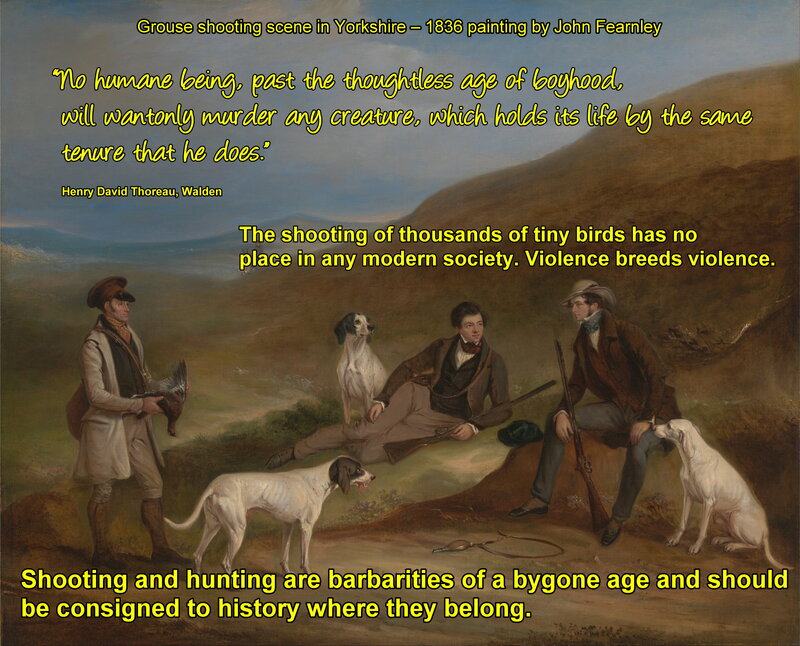 http://markavery.info/2014/06/05/ten-reasons-sign-epetition-ban-driven-grouse-shooting-england/ – The most important reason in my opinion is that the grouse are sentient beings and have the right to live as do all the other creature mained and killed during the preparation for grouse shooting. While shooting and hunting are categorized differently they amount to the same thing and that is wanton violence and the massacre of defenseless sentient creatures for fun. Actions you can take to end grouse shooting. Here is what I have been able to find, please take action if you possibly can. If you live near or are able to get to Ilkley Moor in West Yorkshire there is a protest ramble on August 12th. At least the Bradford District council warn people of shooting. In the Yorkshire and Durham dales which my family visit frequently for walking and just enjoying the countryside there are no such warnings. You can suddenly came across a shooting party in proximity to a popular foot path. While it offers an opportunity to express your opposition this is distressing for many people and could be a safety hazard. On one occasion police ignored our reports of shooters worrying sheep chasing after them in an attempt to remove them from the area saying that there was nothing they could do. It may well be a challenge to say the least particularly if your MP is conservative as the Tories tend to support blood sports, this is probably because a good majority participate in them and they therefore continue to put their own pleasures first, however dubious or unethical, before those of the vast majority who wish to see an end to such barbarities as shooting and hunting. Nonetheless please be persistent keep in mind fox hunting was eventually banned as a result of public pressure. “Wildlife presenter Chris Packham is campaigning for an end to grouse shooting on Ilkley Moor, calling it “moorland vandalism”. He made his comments in a statement to moor owners Bradford Council ahead of the grouse shooting season next week. The council said it permits shooting for just eight days each year, under a contract to be reviewed in 2018. Grouse shooting is a bloodsport People pay vast sums of money (1000-2000 a day) to blast a sentient creature out of the sky for enjoyment. A creature that has been driven towards them to make it easier. Whether or not money changes hands is not the issue though – shooting or hunting animals for amusement is something the Hunt Saboteurs Association is unequivocally opposed to. Grouse are known as the king of gamebirds because of their fast flight. This speed makes a clean kill difficult and results in birds being shot without instantly falling to the ground, and many fly on wounded. 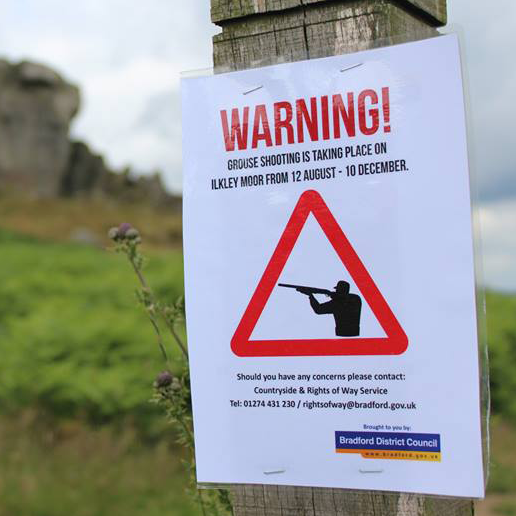 Ban Blood Sport on Ilkley Moor (BBIM) has written to the leader of Bradford Council Susan Hinchcliffe noting that populations of breeding birds have fallen as a result of grouse shooting and related moorland management, and called on the local authority to end the blood sport on public land. This video shows the shocking use of cruel traps. Note the petition referred to is closed. “Well done Terry Pickford for speaking the truth, exposing what gamekeepers would obviously prefer no-one to know. It is a terribly sad situation, but I for one must applaud your efforts over the last 4 decades, working to support and protect Hen Harriers and Peregrine Falcons in the Forest of Bowland, under such difficult circumstances. ” The petition referred to failed. Mickey Rourke a Champion For Animals. Below is a guest post by the animal and human rights activist and supporter of free software Luis Leonel. Philip Andre “Mickey” Rourke Jr. is not only one of the greatest actor of his generation. Also, he is a real gentleman and a champion for animals. One of the most barbarous social injustices is capital punishment and in the modern world it is time this was eradicated for good. Most certainly it should not be reintroduced after a period of sixty years! Three men in the Maldives face death by hanging ‘in the next few days. The Maldives has also agreed to cooperate with the Human Rights Committee. Should they go ahead with the executions, they would be breaking international law, including their duty to protect the three men’s right to life. But it doesn’t have to be this way. People’s lives are too precious to be ended with such cruel haste, and the Maldives still has time to turn back. You can read the full article and send an e-mail to the Maldives by clicking the above link or the link below – you will need to scroll down to read the complete article. Please send the e-mail there is a template message you can edit or if this is not possible send as it is. Please be polite. “Goodbye, filthy stepmother, country of serfs and lords…,” Juan Goytisolo, Catalan writer and intellectual, wrote in his 1970 “Reivindicación del conde don Julián” novel, and sixteen years after he repeated the same words in the “En los reinos de Taifa” memoirs. Filthy stepmother, country of serfs and lords, where massacring animals in the name of art and tradition is a “fiesta”. A “fiesta” supported and defended mostly by the corrupt Spanish right wing. “A bull killed itself on a wooden post after being sent into a terrified frenzy when it’s horns were set on fire in front of a baying crowd. Footage has emerged of the animal becoming confused and scared before it runs a short distance around a ring and hits its head on a wooden post in the small town of Foios in Valencia, Spain.